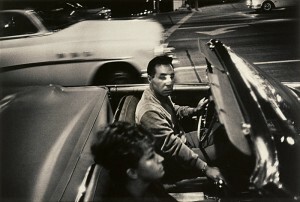 Winogrand was a quintessential street photographer with a great talent for juxtaposing the familiar and the peculiar. He constantly pushed the limits of what could be considered a good picture, crowding his compositions with as much activity, detail, and information about the human condition as the picture frame could hold. 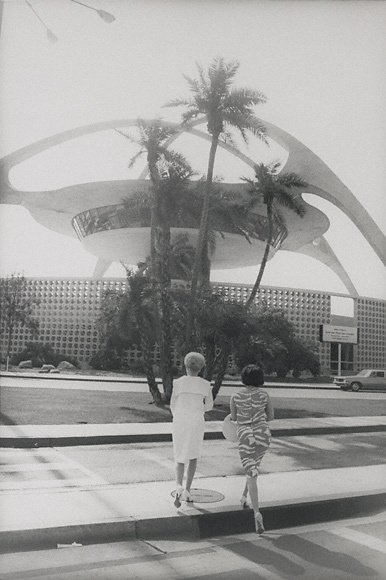 In this image, the parallel between the soaring supports of the recently constructed Theme Building at Los Angeles International Airport and the two sharply dressed women walking toward it was surely not lost on Winogrand. Although he made frequent trips to Los Angeles in the 1960s and ’70s, it was not until 1978 that he moved to the city, which became the primary subject of his photographs until his death in 1984. Exhibition audio: Photographer Anthony Hernandez discusses Winogrand’s work.